Today, my sushi cravings took me on an adventure to White Rock less than a quarter mile from the beach. 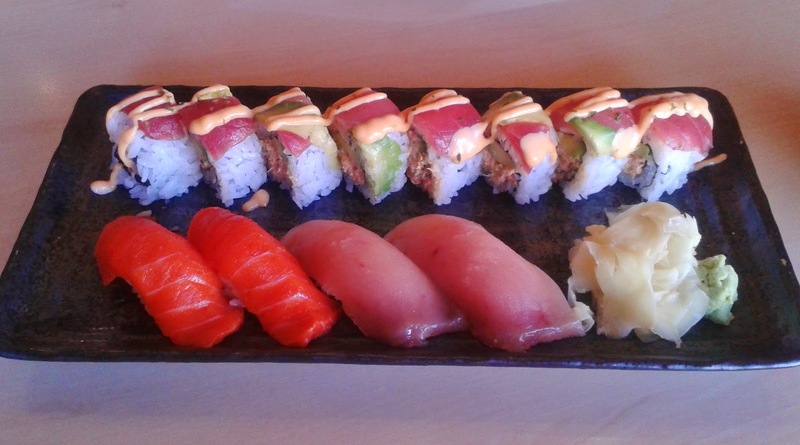 As I walked into Taka's Take-Out Sushi, the bossa nova music made me feel a little like I was on vacation. The restaurant is very small and as the name suggests, this place is really for take out. However, I decided to take one of the very few seats they had to enjoy my lunch. The chef was Chinese and spoke Mandarin to many customers with whom he was familiar. One hundred previous visits to various Japanese restaurants has told me that Chinese sushi restaurants often offer neatly cut sushi and innovation with special rolls. I also find that Chinese sushi restaurants tend to excel at tempura, although no tempura is served at this restaurant (not even the Dynamite Roll). I will refrain from delving into the poor attributes that I also tend to observe at Chinese sushi restaurants. At Taka's Take-Out Sushi, you may have to go to the counter to get what you want, though I wasn't too perturbed by this. It lacked the attentiveness in service as well as the atmosphere typically found in a full-service restaurant, though the plates, dishes, and eating utensils I was provided with would pass in a high-class restaurant. I ordered the Taka's Favourite Lunch special ($13.50) to start, which contained a Miso Soup, the Eamon Roll and 4 pieces of chef's choice nigiri sushi. 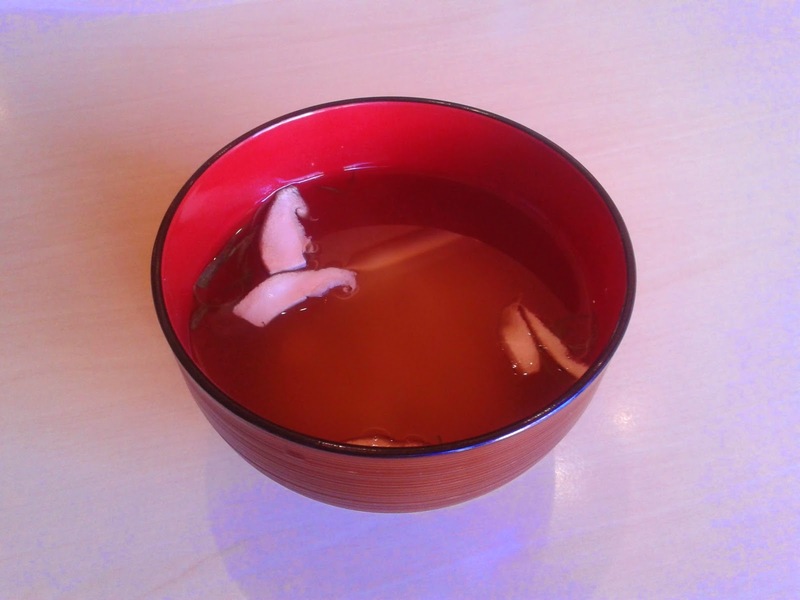 The Miso Soup contained a few pieces of sliced mushroom. The amount of miso paste was very conservative, and it was almost not enough to adequately provide flavour to all of the soup. The soup was not too salty, and I didn't have to experience one of my pet peeves, which is when there are a lot of "grains" of miso paste left in the bowl after I finish my soup. The Eamon Roll contained poached salmon, pickled dills, baby dills, onions, red tuna, avocado and spicy sauce. I couldn't figure out where the name Eamon came from (there was no eel or salmon in the roll), but there was definitely a heavy Western feel to this roll. If you are looking for authenticity, this is definitely not the right thing to order. The sweet chili mayonnaise sauce used on top provided just the right amount of spiciness to the roll. The poached salmon, the dill and the spicy sauce worked well together to create an excellent filling for both a sushi roll and a sandwich. The avocado was sliced thin to prevent the roll from being too creamy. The red tuna on top was masked by the filling though, so I thought it was a little bit of a waste to use such an expensive fish here. 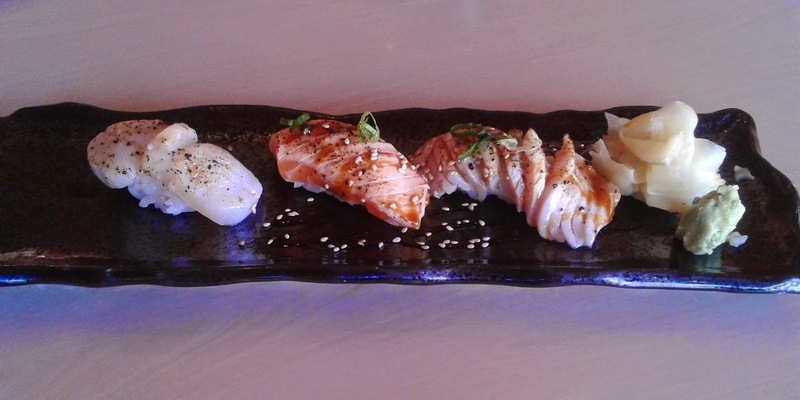 The chef's choice nigiri ended up being two pieces of Sockeye Salmon Nigiri and two pieces of Albacore Tuna nigiri. The fish was quite fresh and the knife skills as well as the proportions of fish to rice were both on target. The sushi rice used very little vinegar, if any, but held together well. The sockeye salmon was a little tougher than expected, but the tuna was soft enough to almost melt in my mouth. And now it's time for my favourite part of any sushi adventure - seared sushi! The Aburi Sea Scallop Nigiri was well-seasoned with sprinkles of pepper, though the torching of the nigiri had little effect other than "half-cooking" the scallop in one corner. The Aburi Atlantic Salmon Toro Nigiri was rather sweet and closer to tataki than aburi, with most of the flavour coming from the sweet soy underneath (good try). The Aburi Albacore Toro Nigiri was definitely the tastiest of the three, having a nice smoky flavour and being covered with savoury fish oils. The sweet soy worked surprisingly well with this piece of nigiri, and if there was just a bit more of the soy, this piece of nigiri would have earned an A+. Well, that was certainly some nice mini "vacation" I had there. Taka's Take-Out Sushi puts White Rock on the map for good sushi, and is quite worth the visit despite the lack of ambience and full service. Whatever they lack in terms of authenticity, they make up for with their superior choice of ingredients for each item, which work together well to bring a sense of uniqueness, careful experimentation and skillful creativity.